I grew up a wrestling fan, but started to lose interest around the age of 13. Still, this is pretty exciting news. 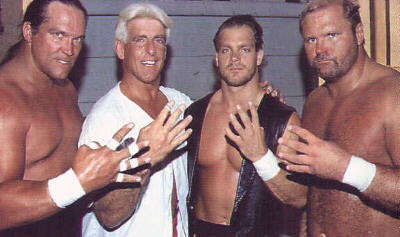 The Four Horsemen are reuniting in Charlotte. Led by superstar wrestler and Charlotte's favorite hometown celebrity, Ric Flair, the Four Horsemen will reunite for the NWA Wrestling Legends Fanfest Weekend, being held August 6-9 at the Hilton University Place Hotel. The original group of Flair, Ole Anderson, Arn Anderson, and Tully Blanchard, plus second-incarnation member Barry Windham and the group's legendary manager James J. Dillon are all scheduled to appear Friday, August 7 to sign autographs and pose for pictures with fans. Nearly 30 wrestling legends are confirmed for the four-day event. You can get all of the details by visiting www.nwalegends.com.